Home Assets What are Current Assets? These are assets which are held by a business for a short period, mainly a year, or within an accounting cycle of a business. 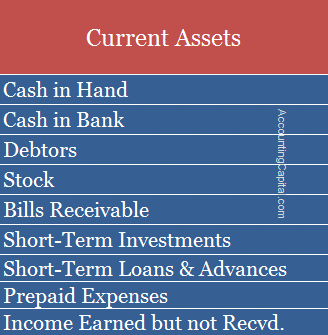 Current Assets are a balance sheet account that can either be converted to cash or used to pay current liabilities within the above mentioned time frame. These are typically seen as those assets which can easily be converted to cash to pay off current liabilities and outstanding debt payments. Greater the number higher the liquidity of a company which leads to more working capital. It is important because it is used day in and day out to pay off a firm’s usual expenditure which is important for its operations. Such expenses include utility bills, short-term debts, overheads etc. Examples of current assets include Cash, Bank, Debtors, Stock, Prepaid Expenses, etc. They are shown on the Assets side of the balance sheet. Such short-term assets are also called circulating assets, circulating capital, or floating assets. 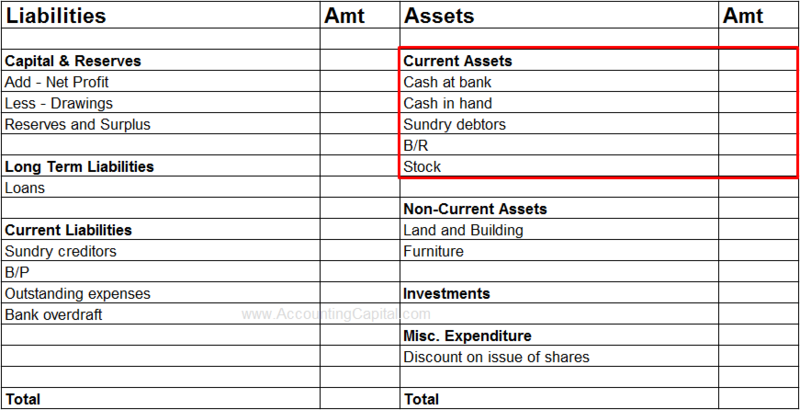 They are shown in the assets section of the balance sheet. The current ratio which can be calculated as CA/CL also highlights the importance of having enough short-term assets Vs. short-term liabilities.